The campground at Trail Bridge Reservoir is a great place to stay for a day or two while you dive the lakes and reservoirs of the Central Cascades. The bay directly in front of the campground is an easy and simple dive where you can hone your dive skills, play around in the grass and algae beds, and hunt for golf balls that other campers have chipped into the lake. The water can be quite warm by Oregon Cascade standards in the summer when the bay heats up in the sun. Practicing skills underwater at Trail Bridge Reservoir. This Trail Bridge Reservoir site doesn’t have too many interesting things to look at underwater but it is pretty fun to hunt for golf balls. This is a good site to practice skills, try out new gear, or burn the last air in your tanks after doing dives at other sites in the area. There are also plenty of tree stumps to check out. This dive site is in the middle of nowhere. The closest larger town is Eugene/Springfield. The little town of Rainbow is down the McKenzie River Highway but is not close. You need to be self sufficient at this Oregon dive site. 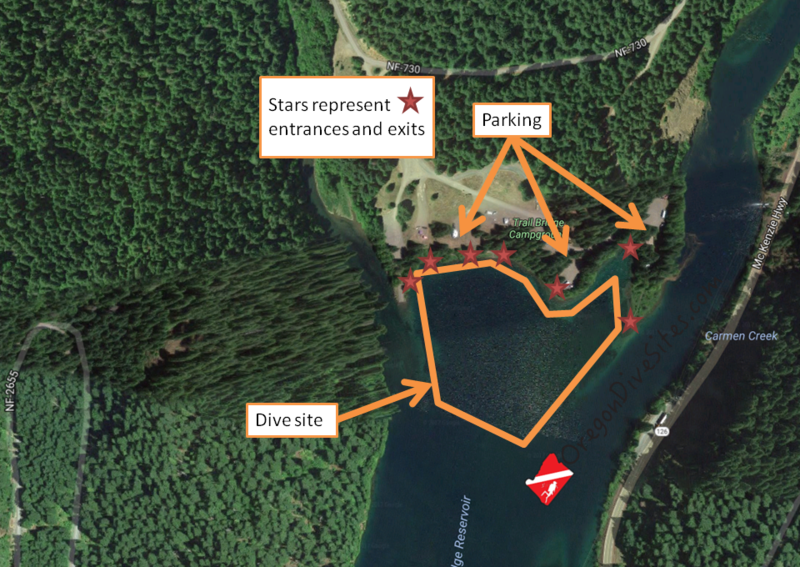 Most people will drive up the McKenzie River Highway (State Highway 126) from Eugene, Oregon to reach this dive site. The left turn onto the National Forest road can be a little tricky if there is much traffic. Signal and brake early for the turn. Once you’re on the forest road, follow signs for the Trail Bridge Campground. Imagery ©2017 Google, Map data ©2017 Google. Parking and camping are plentiful at this dive site. There is ample parking all along this dive site. In the summer, many of the places to park are filled with weekend campers. The boat ramp area to the west of the dive site usually has space to park and assemble dive gear if nowhere else does. While the parking has been free for day use when we have gone SCUBA diving at this site, that may change in the future. Be sure to check at the information kiosk for up-to-date details. The dive site is laid out around a large shallow bay. If you go north, you will hit land and a close-by exit. If you go south, you will end up in somewhat deeper water and run into the Trail Bridge Dam. Don’t get too close to the dam’s water control system or you could end up getting sucked over, under, or through the dam which would put an early end to your SCUBA diving career. 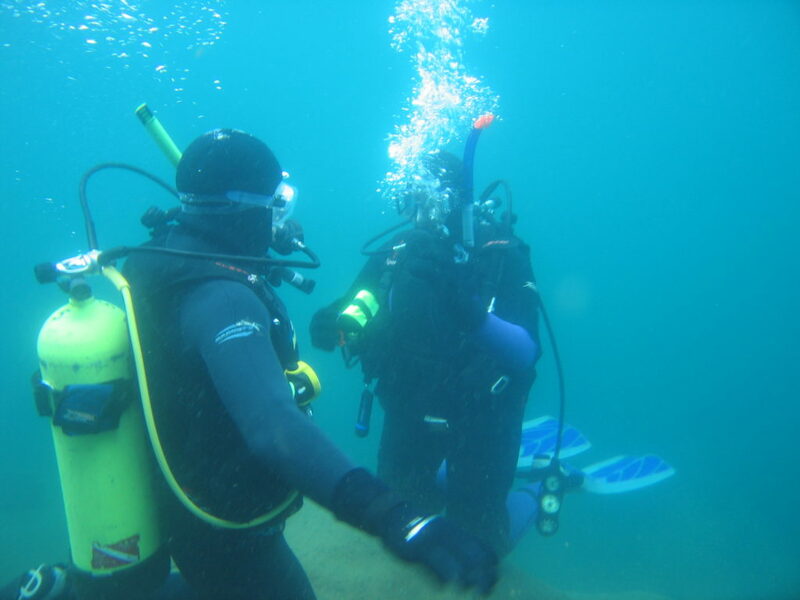 There are plentiful entrances and exits all the way around the west, north, and east sides of this dive site. You can usually park your car right next to one of the entrances. Some of the entrances and exits do have a big step down to the water but many are gentle slopes into the water. The boat ramp provides access for divers with limited mobility. This is a shore dive although you could launch a boat into the lake and practice boat diving if you wanted. The water level in Trail Bridge Reservoir can change rapidly depending on what the Eugene Water and Power Board is doing with the hydroelectric projects along the McKenzie River. Over the course of an afternoon, we have seen the water level change by seven feet. Visibility is usually about 20 feet in this part of the reservoir. The bottom has a lot of silt on it that can be easily stirred up leading to near zero visibility. It can take a while for the silt to settle back down on the bottom. We have seen the shallower portions of the bay reach 55F in the summer while in the spring, the deeper portions can be 40F. Usually the lake seems to be around 45F. 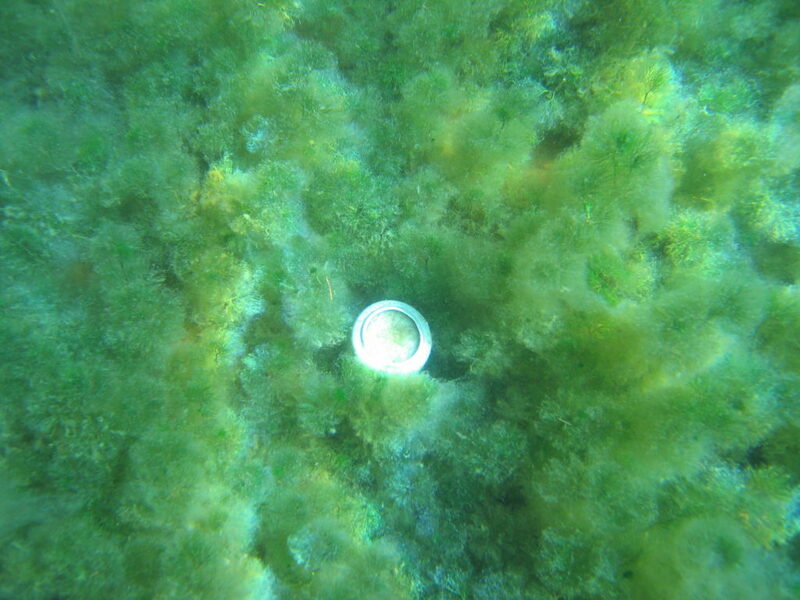 One of the ubiquitous beer cans that you can find on the bottom of this dive site. If you want a good project for your scout troop, collecting all of the aluminum cans and taking them to be recycled would be a great way to spend a weekend. We prefer diving Trail Bridge Reservoir in the fall although the spring and summer are also good times to go SCUBA diving here. If you go way out toward the dam, you can sometimes find 50 feet of water. Usually though you will be between 15 and 30 feet deep. This lake is at 2,000 feet above sea level. That means that you need altitude diver training to dive the lake safely. The site otherwise can be enjoyed by anyone from a fresh open water diver to experienced divers with thousands of logged dives. This dive site is very easy and accessible. The only difficulty is that it is an altitude dive and you need the training to dive at altitude. Depending on how far away you have to park from the shore, between 10 and 100 feet of walking might be needed. If you surface at the wrong place (this is a great place to practice navigation skills), you might have to walk farther. You will want to swim 50 to 100 feet away from shore to start your dive in deeper water although if you want, you can start diving as soon as the water is waist deep. The water level at Trail Bridge Reservoir can change suddenly, dramatically, and without warning. On one dive, we started the dive with the lake full and came out after the dive with the water level dropped by five feet! Motorboats do use this lake. It might be a good idea to have a diver down flag. We have our favorite diver down flag listed on the Gear We Use page. There are no nearby SCUBA shops at Trail Bridge Reservoir. The closest shops are in Eugene and Springfield over an hour away. You need to be self sufficient at this site. There is a limited hot food service at the resort at Clear Lake up the McKenzie River Highway. Otherwise there are a couple restaurants in Marion Forks and Rainbow. Each little town is more than a half hour away from the dive site. The cabins at the resort at Clear Lake have been used by divers in the past. Be sure to ask what to do with your dive gear and then follow what the resort staff tell you to do. We want to be able to keep using these cabins! All around the dive site is public camping. Usually you can find a good site to setup your tent or park your travel trailer. If all of the good sites are full, there is more camping at Clear Lake and Smith Reservoir. You can also do primitive camping in the National Forest although you should check with the local ranger office for any fire restrictions or camping restrictions due to logging activity.